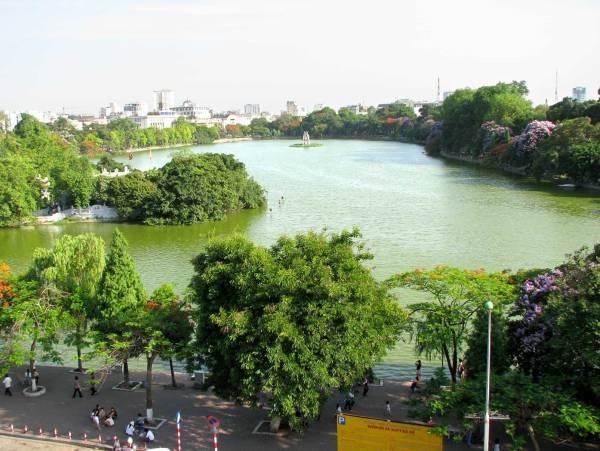 HÀ NỘI — The capital city’s Hoàn Kiếm Lake will be dredged and cleaned by the end of July, said Võ Tiến Hùng, general director of Hà Nội Sewerage and Drainage Company Ltd. Speaking at a press meeting on Tuesday, Hùng said the lake is severely polluted and has lost the ability to revive itself. Its water quality is getting poorer by the day, its pH level is high, and the amount of suspended deposits is higher than the permissible limit at all five monitoring locations. The lake also has high organic contamination, with the indices for both biochemical oxygen demand (BOD) and chemical oxygen demand (COD) two times over the limit, he added. The lake water has lost its distinctive dark green colour in several spots, and there is a one-metre layer of mud at the bottom of the lake, polluting it and reducing its water level to 0.5 to 0.8m. The company will maintain the colour of the lake during the cleaning process as requested by the city, Dũng said. The lake is a major national monument, so the proposed cleaning project will be sent to the Ministry of Culture, Sports and Tourism and Ministry of Natural Resources and Environment so that they can review the environmental impact evaluation.